Working in a cheerful place with friendly faces, green plants and a congenial atmosphere is definitely preferable to stark walls and stern glares. A happy staff tends to mean increased efficiency and effectiveness, and thus improved productivity. And green plants certainly cheer everyone up, and relieve stress too. They also deaden noise, which allows greater concentration. 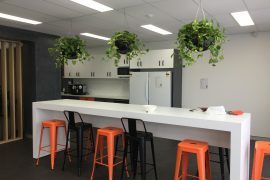 Many plants mitigate pollution too, which in turn improves the general health and humour of employees and the whole office. Air pollution causes tens of thousands of deaths worldwide every year, both indoors and outdoors, and costs governments and health services billions of dollars, but plants are natural purifiers as they inhale pollutants and carbon dioxide, and exhale oxygen. It’s a fact that we feel better surrounded by plants and flowers — especially orchids, ivy and aloe vera. Expensive desks and company banners don’t do nearly as much for memory and efficiency as a few potted plants dotted around the workplace. But of course you need plants that do well indoors and in artificial light rather than sunlight: ferns and cactuses, palms and philodendron, which can go for days without water, taking what they need from the air. Actually, most people like to have something to take care of too. From Noosa to the Gold Сoast and out past the Blackall Range, Bretts Plants supply industries, events and functions with suitably beautiful plants. Hire some potted plants today and see the difference in your home, studio, shop or office. Colours and textures and different shades of green transform the workplace and bring it to life. There is no challenge we can’t rise to and you can rely on an original, distinctive and individual ‘plantscape’ for every requirement and décor. A Bretts Plants’ plant is grown in a special water-retentive mix to ensure a long healthy life indoors. And our 4,000-square-metre nursery ensures that there is always enough stock available in the right colours and sizes to replace and revive plants under the contracts. Let us design your planters too. Go green this winter.